The cosmodrome and the Soyuz. Baikonur is an entire Kazakh city, rented and administered by Russia. The Baikonur Cosmodrome facility was founded in 1955, when Kazakhstan was a part of the Soviet Union. The Cosmodrome is one of the oldest space launch facilites still in operation. In the picture above, the Soyuz TMA-22 spacecraft is rolled to its launch pad in preparation for a mission to carry new residents and a spaceflight participant to the International Space Station. 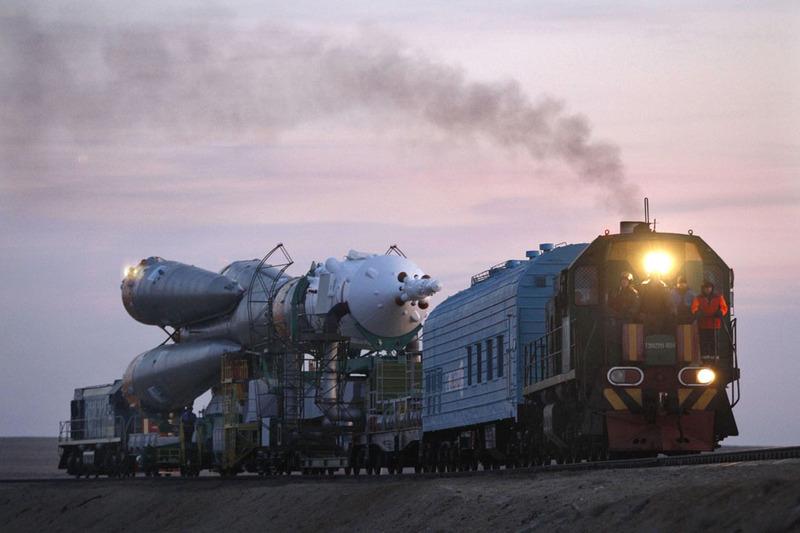 The Soyuz began the move from its assembly and integration building to the launch pad on a railcar at sunrise, arriving at the pad several hours later for final technical preparations. Since NASA’s last Space Shuttle mission landed, the United States do not have the capability to get astronauts into space again until the scheduled launch of the new Orion spacecraft in 2015. Over at least five years, the U.S. manned space program will be relying heavily on Russia and its Baikonur Cosmodrome. More about Baikonur and the Soyuz. The Baikonur Cosmodrome hosts also the relic of Buran, the forgotten Soviet Space Shuttle. More pictures — and some credits for this post — may be found here. Some technical information on Soyuz Mission 22 were posted on this blog. Physics4me published a couple of amazing pictures, and a video, about the most recent landing of the Soyuz. 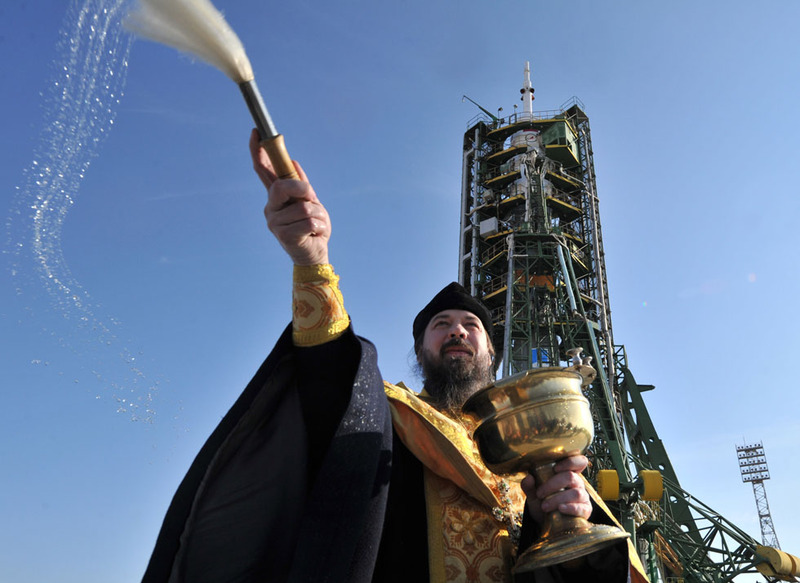 In the picture below, a Russian Orthodox priest blesses the Soyuz TMA-22 spacecraft at the launch pad of the Russian-leased Baikonur cosmodrome on November 12, 2011. The launch of the Soyuz TMA-22 with an international crew aboard including US astronaut Dan Burbank, Russian cosmonauts Anton Shkaplerov and Anatoly Ivanishin, was scheduled on November 14. Reblogged this on My blog collection arts design individu. Great. Happy you liked my post!